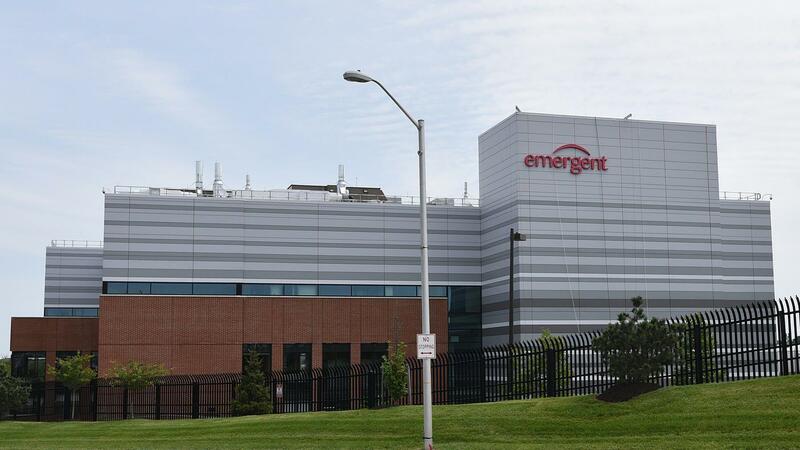 Drug manufacturing facility of Emergent BioSolutions at Bayview campus located in Baltimore, Maryland. Image by Barbara Haddock Taylor via The Baltimore Sun. Upon arriving to the Bayview campus, we were officially welcomed by Scott Battist, the vice president, general manager,and site head for the drug substance plant. Then, Paul Mutolo and Brad Sepp joined Scott in providing us with an overview of the company and a thorough description of Emergent’s new clinical and commercial drug substance manufacturing area.The Industry Relations arm of the Hopkins Biotech Network (HBN) helped facilitate a half-day visit to the manufacturing facilities at Emergent BioSolutions on October 19th, 2018. Postdoctoral fellows and students from Johns Hopkins University and other neighboring institutions participated in Emergent BioSolution’s Manufacturing Day at their Bayview campus in Baltimore, Maryland. Emergent’s Bayview campus is one of three Centers for Innovation in Advanced Development and Manufacturing (CIADM) designated by the U.S. Department of Health and Human Services to develop, manufacture and deliver a range of medical countermeasures (such as vaccines) for biological and chemical threats as well as infectious diseases. For example, if there is an unprecedented spread of the Ebola virus in the United States, Emergent BioSolutions Inc. is one of the biodefense and global life sciences companies that manufactures and provides products for civilian and military communities addressing such public health threat. Manufacturing – operators control manufacturing equipment and machinery to produce pharmaceutical components and products. Manufacturing Science and Technology (MS&T) – scientific leaders oversee technology transfer (new product introductions and process improvements) into manufacturing as well as implementing product development projects from research and development into standard commercial manufacture. Engineering – this group is composed of process and automation engineers responsible for the mechanical and electrical systems of bioprocess equipment. Quality – comprises administrative and procedural activities executed using a quality management system so that requirements and goals of a product are fulfilled. Validation – is a process by which the quality and integrity of all elements implicated in the manufacturing process are reviewed/tested. After grasping the function of each industry team from the poster conversations, we started the Bayview Manufacturing Area 3 facility tour in the locker rooms. We put on our hair caps and booties while the tour guides explained how their facility has a unidirectional flow of people, material, equipment, and waste across multiple functional areas within their segregated manufacturing units. This linear setup helps minimize product contamination. With our booties and hair nets on, we entered the future clean room (clean sites were still under construction) before continuing to the Fermentation/Cell Culture room. This culture room will allow for commercial-scale production of therapeutics, as it is currently being modified to support multiple single-use bioreactors, each with a capacity of 3,500 liters! A disposable or single-use bioreactor refers to a bioreactor with a disposable bag instead of a culture container. Typically, this means that plastic bag inserts are used in the bioreactor, speeding up the cleaning and sterilization process while cutting down the time between each use from several days to 48 hours. The Fermentation/Cell culture room was followed by the Harvest area, which will support clarification and capture steps, including centrifugation, filtration, and chromatography. Next, we explored the Purification area, which will support up to three 80 centimeters columns. The primary and final purification rooms are separated, and each room has enough space for media and buffer preparation to support operations. The Quality Control labs and the warehouse were the last two stops of the tour. Our trip guides informed us that analytical product testing, raw materials and release testing, and cell culture potency testing all occur at their quality control unit. As for the warehouse, this is where shipping and receiving as well as raw material sampling and distribution takes place. 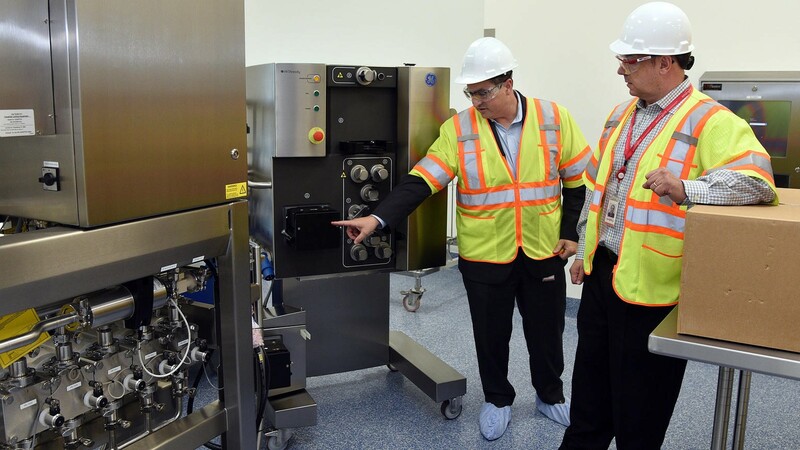 Overall, the manufacturing process starts by allowing vaccines and other drugs to be mixed and cooked in the Fermentation/Cell Culture room to then be moved through filtration and purification systems before being inspected and packaged. The products can also be stored, should they be called on for surge production. If there is a flu pandemic tomorrow, ideally, designated innovation centers like Emergent’s are built out to accomplish rushed production of millions of flu vaccine doses. With that, our tour concluded. We were then redirected to the main conference room for a networking lunch where students and postdocs from the Baltimore area were able to enjoy one (or multiple) slices of pizza and discuss career paths with Emergent employees and/or other prospective industry leaders. If you would like to partake in future site visits to local industries, keep an eye on your JHU e-mail for upcoming treks hosted by HBN!